Q: Can I also buy the IT8 calibration option for the SE version? A: Unfortunately, that's not possible. This advanced feature is only available for users of the professional version SilverFast Ai Studio and Archive Suite. Please consider that as the owner of an SE license, you can upgrade at a reduced rate to an Ai Studio and Archive Suite. Q: I already own a target, but I still need the corresponding file. How do I determine which file I need and where can I download it? 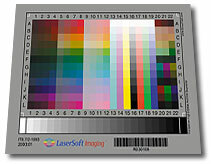 A: A high quality target from LaserSoft Imaging has a barcode that can be read by SilverFast. The corresponding reference file is thus automatically identified and used if already on hard disk or (on the SilverFast Ai Studio or Feature) CD. Otherwise the appropriate file will be loaded from our webserver, if the computer is connected to the internet. If you do not have a target with such a barcode below the gray wedge, SilverFast can not automatically detect which target is used. A dialog will appear on your screen asking you for the reference file to use. A large number of reference files can be downloaded from our website. Q: Can I test the IT8 feature with the Ai Studio demo version? But you can watch the process in a movie. Q: Do I need different targets if I want to run calibrated reflective scans and also calibrated transparency scans? A: Yes, because for different light sources in the scanner different profiles need to be created. Therefore, you may need both a reflective and a transparency target. The generated scanner profile for one light source (e.g. transparency scan) can not be taken into account when scanning with the other source (reflective scan) - in this case it would be scanned without calibration. Of course, you can calibrate both light sources with the corresponding targets and SilverFast. SilverFast then automatically uses the appropriate scanner profile. Q: What is the Delta-E value? A: When the IT8 Calibration has been finalized, SilverFast will display a Delta-E value. During IT8 calibration, SilverFast shows a Delta-E value for the measured mean deviation. This deviation is the average deviation of the measured values from the expected values of the reference file for each color field. Find out what this value exactly means in this PDF file.